This page lists events, workshops and courses hosted or sponsored by OIRM. Can’t make it in person? Some of our events are live streamed on our YouTube channel. Please click on individual listings for more details. We encourage live tweeting at our events using #OIRMevents. 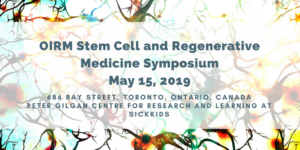 OIRM in collaboration with the Hospital For Sick Children’s CFIT Program are pleased to offer a 4-day hands-on workshop looking at the ‘Directed Differentiation of iPS Cells into Systems to Model CF Lung Disease’. This comprehensive course will cover methods to maintain human iPS cells in culture and the directed differentiation of these cells to epithelial cells suitable as models for the study of Cystic Fibrosis (CF). We will discuss and demonstrate important aspects of the workflow, including characterization of patient-derived iPS cells and how they can be used as a model system for the study of CF lung disease. The course is open to Canadian and International academic trainees with limited space available to industry participants. 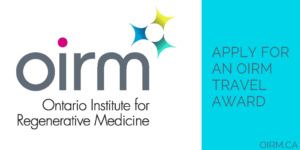 Both the CFIT Program and OIRM are providing a limited number of trainee travel/registration awards for successful applicants. More information about this workshop and travel awards can be found on the CFIT website or download the poster. For more information on this course, please contact the Program Manager, Paul Eckford at peckford@sickkids.ca. or Jodi Garner at jodi.garner@oirm.ca. The annual North American Veterinary Regenerative Medicine Association (NAVRMA) conference is an important event for the veterinary and translational regenerative medicine community. It supports collaboration between practicing veterinarians and research scientists, offers a venue for sharing the latest information on regenerative medicine, and promotes development of skills and techniques for practicing veterinarians. This meeting also builds on the One Health approach and has significant input from human health researchers for the purpose of better the lives of animals while also gathering important pre-clinical data for the benefit of human medicine. The 2019 NAVRMA meeting will take place in Niagara-on-the-Lake, being the first time this meeting will be held in Canada. To register and learn more click here. OIRM members can use the promo code OIRM2019 to receive special discounted pricing. The Till & McCulloch Meetings are Canada’s stem cell research conference. As the only conference of its kind in Canada, TMM provides an unparalleled opportunity to meet and network with Canada’s leading stem cell scientists, clinicians, bioengineers and ethicists, as well as representatives from industry, government, health and NGO sectors from around the world. The 2019 Till & McCulloch Meetings will take place in Montréal, Québec, November 4-6, 2019. Registration is open. Submit your abstract by July 3, 2019 to be considered for an OIRM travel award.